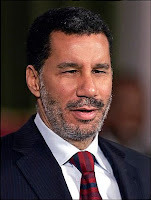 the nytpicker: When Did David Paterson Know About Assault Charges Against Aide? More Contradictions Emerge In NYT's Coverage Of Case. When Did David Paterson Know About Assault Charges Against Aide? More Contradictions Emerge In NYT's Coverage Of Case. In today's page-one NYT story on the David Paterson case, the NYT states flatly what remains unclear about the Governor's knowledge of the criminal charges made against his aide, David Johnson. The trouble is that its latest account contradicts, in important ways, previous assertions made by NYT stories against Paterson -- with no explanation of the conflicting statements. One of the most pivotal issues in the case -- and the one the NYT keeps flip-flopping about -- concerns when Paterson first heard about the assault charges made by Sherr-una Booker last Halloween against his top aide. It's a crucial piece of information, because if it's demonstrated that Paterson knew of criminal accusations against his aide and tried to cover them up, he would himself face the possibility of criminal charges, including witness tampering. In a story that appeared on February 26, the NYT reported that Paterson had "been apprised several weeks ago" of the charges of a "violent assault" against his aide. That statement was attributed to a "senior administration official." But in more recent accounts, the NYT has hedged significantly on this allegation -- and, in fact, has never repeated that assertion about the Governor's knowledge of the facts of the case. In a page-one story published on March 19, the NYT said only that a "former administration official said it was assumed" that Paterson knew about the criminal assault charges in January. The NYT didn't elaborate on how "it was assumed," or by whom. By today's story, the NYT has hedged even more significantly on this point, reporting only that "it was unclear" whether the Governor "then knew all of the details" of the case, referring to the point when he was in contact with Ms. Booker in early February. It's a bundle of contradictory assertions that don't match up, and that the NYT doesn't acknowledge anywhere in its accounts. If, as the NYT's anonymous "senior administration official" asserted in February, Paterson knew for "several weeks" about the nature of the charges, then Paterson would apparently be guilty of an effort to cover up a crime. If that assertion was wrong, then the nature of Paterson's involvement in the Booker case remains a murky question. Throughout its coverage of the Paterson case, the NYT has been guilty of reporting assertions and then later dropping them without acknowledgement. For instance, the NYT's early stories reported -- with an attribution to Sherr-una Booker's lawyer, Lawrence Saftler -- that the Governor had called Booker on the day before her court hearing; later, when it was revealed that Booker called Paterson, the NYT never admitted that a key, named source of information had fed them false information. Here are excerpts that illustrate the contradictory ways the NYT has addressed this latest matter in print, beginning in late February, shortly after the scandal broke. [Paterson] also said that he became aware of the disturbing allegations involved in the case only on Wednesday. But a senior administration official, speaking on the condition of anonymity because of the continuing investigation, contradicted that account, saying the governor had been apprised several weeks ago. They said that in her testimony for Mr. Cuomo’s inquiry, Ms. Booker spoke of how, among other concerns, Mr. Paterson had expressed worry about how she would portray the episode with Mr. Johnson to reporters. It is not clear when the governor learned that she had accused Mr. Johnson of using violence against her. In Ms. Booker’s testimony, she said that most of the governor’s conversations with her concerned ways to tamp down a possibly damaging newspaper article, according to the people who know her version of events. She also told the governor that she was annoyed because a reporter had contacted her about Mr. Johnson. One former official said it was assumed that Mr. Paterson knew of the dispute involving Mr. Johnson no later than early January. It is also unclear if Mr. Paterson then [in early February] knew all of the details of what Ms. Booker had told the police was a violent assault on Oct. 31 in the Bronx apartment she shared with Mr. Johnson. We consider the Paterson story legitimate and important -- and we applaud the NYT's aggressive coverage of the governor's actions. We've admired the NYT's tenacity on the case, and believe Paterson's behavior has been contradictory and elusive. He should have fired his aide, David Johnson, immediately after the first story appeared. We won't be surprised if it's eventually learned that the Governor, indeed, was involved in a criminal coverup and/or witness tampering in the case. That said, we find the NYT's coverage at times far too eager to push allegations into print, especially on an investigative story of this magnitude. And when those charges don't remain supported by later revelations, the NYT has shown an inappropriate willingness to simply drop its assertions from stories, without acknowledging its own changing narrative to readers. On a story as complex and important as this, the NYT owes its readers a transparent and thorough accounting of its allegations and reporting -- instead of pretending that its previous assertions about Paterson's knowledge or actions no longer exist, or apply. NYT Caught In Bed With High-Priced Models! Note To Readers: We're Human.